Welcome to my contribution to Word-Filled Wednesday, hosted this week by the lovely Christy at Critty Joy. Be sure to stop by her blog for more visual inspiration from Scripture. I just love waterfalls. Love the sound of them, the look of them. They always remind me of the Lord's overflowing love and mercy - and everything else that overflows from Him. Be sure to stop by Christy's blog for more visual inspiration from scripture. I enjoyed this, bless you. I love this verse! It was the very first verse "given" to me by a dear friend in middle school and it's stuck with me ever since. It's easy to overflow with all kinds of not-so-pleasant stuff. What a wonderful goal to pray for, work for,and aspire to. I must be needing to hear scripture on 'peace' today. Also, love the new look of your site. Sorry to have been away for so long. 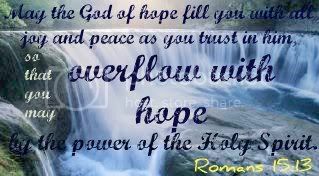 lovely... it is my prayer that I may overflow with HOPE ... Oh God please!!! Not the first Romans I've seen today...hmmmm...a message for me! Thanks for the blessing today! Such beautiful picture and powerful Word ~ God gives us all those things. this is gorgeous Joanne! I adore waterfalls....and this verse with that photo....lovely! Overflow...what an image to go with that!